﻿ Tannette's Villa, Seychelles Islands | FROM $93 - SAVE ON AGODA! "Throughout our stay all the staff made us feel so welcome an..."
Have a question for Tannette's Villa? "Good WiFi (small charge) Very good breakfasts & eve I g meal option." "All the staff is very friendly and helpfull." "Had lovely breakfast everyday, Loved the music which is being played all day and till 10pm." "The location is just perfect." Nestled in the heart of La Digue Island, Tannette's Villa is an ideal spot from which to discover Seychelles Islands. Set from the excitement of the city, this 3-star hotel commands an excellent location and provides access to the city's biggest attractions. A well-kempt environment and its proximity to Veuve Reserve Information Centre, Mason's Travel, Safari Club give to this hotel a special charm. At Tannette's Villa, the excellent service and superior facilities make for an unforgettable stay. Guests of the hotel can enjoy on-site features like express check-in/check-out, luggage storage, car park, room service, family room. 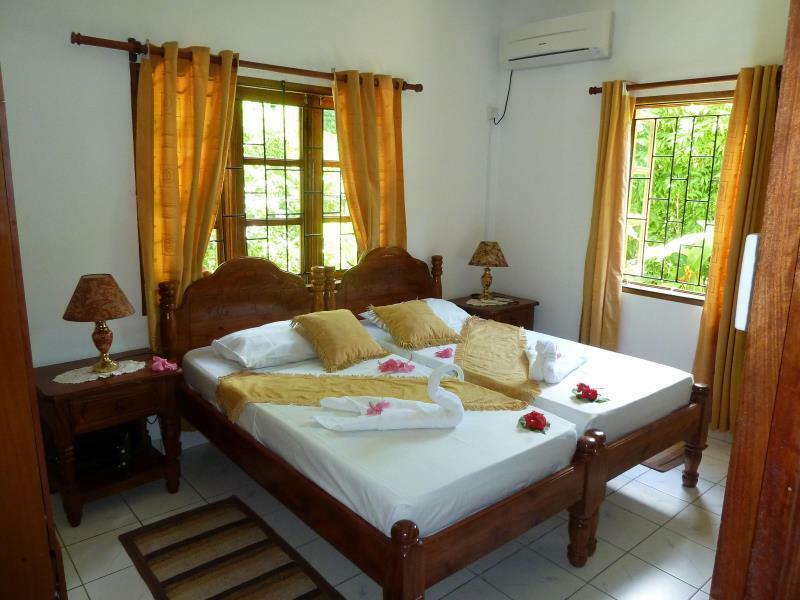 Tannette's Villa is home to 5 bedrooms. 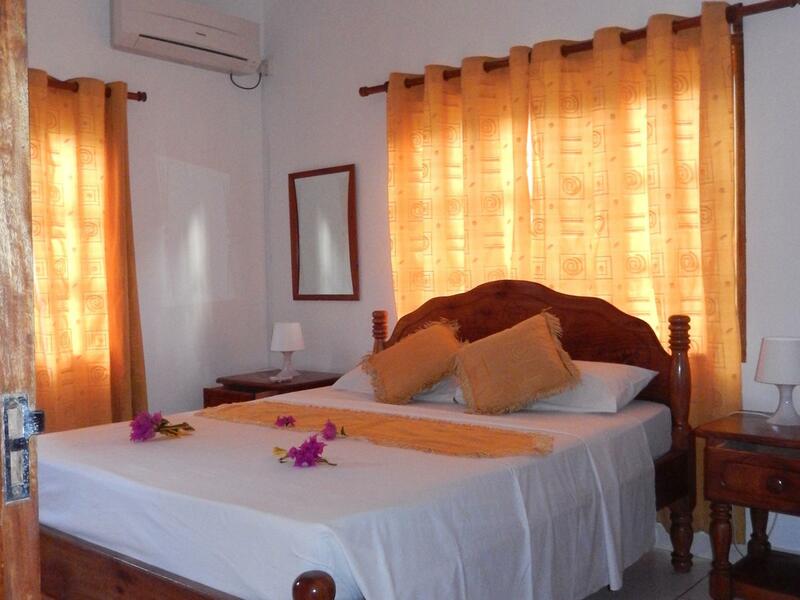 All are tastefully furnished and many even provide such comforts as linens, towels, closet, air conditioning, desk. Throughout the day you can enjoy the relaxing atmosphere of the garden. 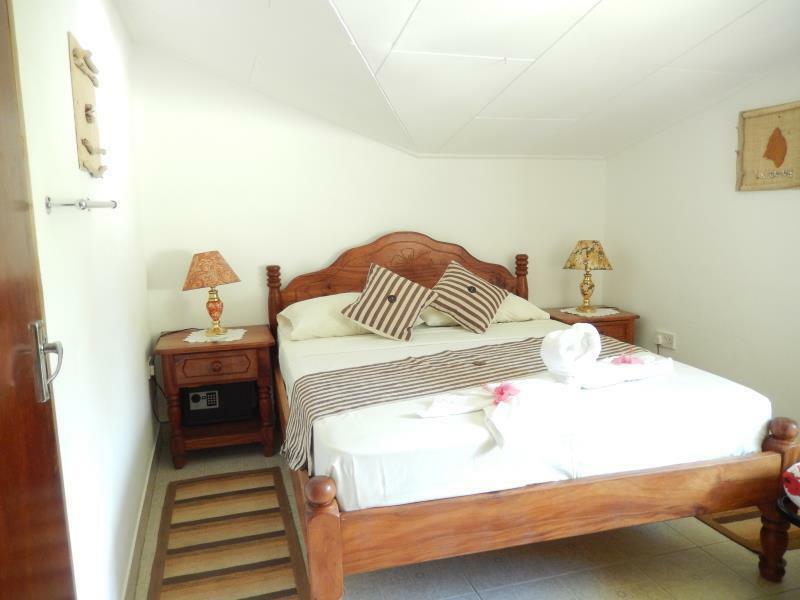 When you are looking for comfortable and convenient accommodations in Seychelles Islands, make Tannette's Villa your home away from home. "I really really recommend the dinner at Tanette's, easily th..."
Warm welcome from Noella. Nice upstairs room, quite small but very clean. Nice shared balcony. Good WiFi (small charge) Very good breakfasts & eve I g meal option. Also provided bikes for 100 SCR each pet day. Juliette and Tannette very helpful and friendly. Just a 5-10minute bike ride from jetty & shops. Great location would stay again if return. It's the 3rd time I have stayed at Tannette's and I'll be back again soon. 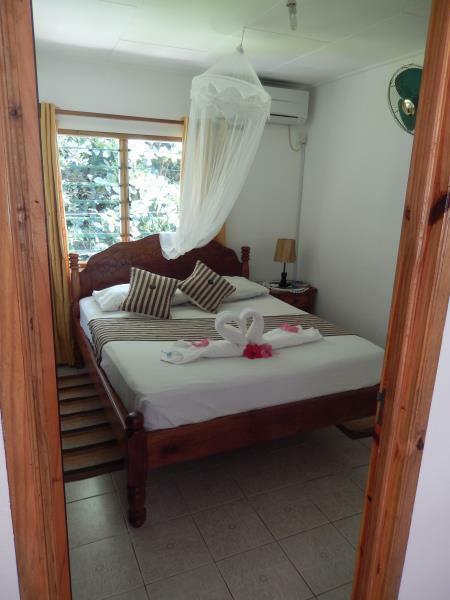 It's in a great location in the centre of the island, convenient for everything and quiet. There's people about if you want to talk, but it's also possible to have time on your own. Tannette and her helpers are extremely kind and helpful; the food is excellent. Remember to have dinners there too! Stay was enjoyable although on the first night they had double booked our room and we were moved to a much less accommodation closeby. They offered free rental of two bikes gor one day in vompensation which we thought did not make up for the difference in rooms booked and offered. But we negotiated something and then it was fine. had a perfect stay here on one of the most beautiful islands we have ever seen! you can rent bicycles and that's all you need to get around the island. wifi wasn't the best but really if you are worried about wifi on an island as wonderful as this then you shouldn't really visit! amazing breakfast and wonderful hosts!! thank you! I travelled with a friend and like all the other guests we really liked the place and especially the breakfast. The villa is not at the beach but within the forest between lots of Seychelles homes. Colorful and beautiful. They offer bikes for rent cheaper than in the official rent places at the jetty. And biking along the beaches gives you a feeling of real vacation. Unfortunately we only stayed 2 nights. Had we known before that La Digue is so beautiful we would have stayed longer. The beaches are almost empty, clean, clear water. From the bike path we saw tortoises and rays in the water so clear was it. Tanette is a really good chef and apparently also the dinner was amazing. We would always come back but for more than 2 days. Tanette's villa can teach us all a thing or two about hospitality. From the moment my husband and I walked through the gates, we were greeted with a big friendly smile and a fresh fruit smoothie and a refreshing citronella scented towels. Throughout our stay all the staff made us feel so welcome and they were so professional. Breakfast was a wonderful treat each morning! The garden itself was lovely as was the rest of the property. The only cons were that it cost 10 euros to use the WiFi that doesn't even work in the rooms and that the rooms could use a little updating. I stayed at Tannette's for three nights. Loved every bit of it. The location is just perfect. Quiet and towards the end of a road. Had lovely breakfast everyday, Loved the music which is being played all day and till 10pm. Room were lovely. Cosy and nicely decorated. 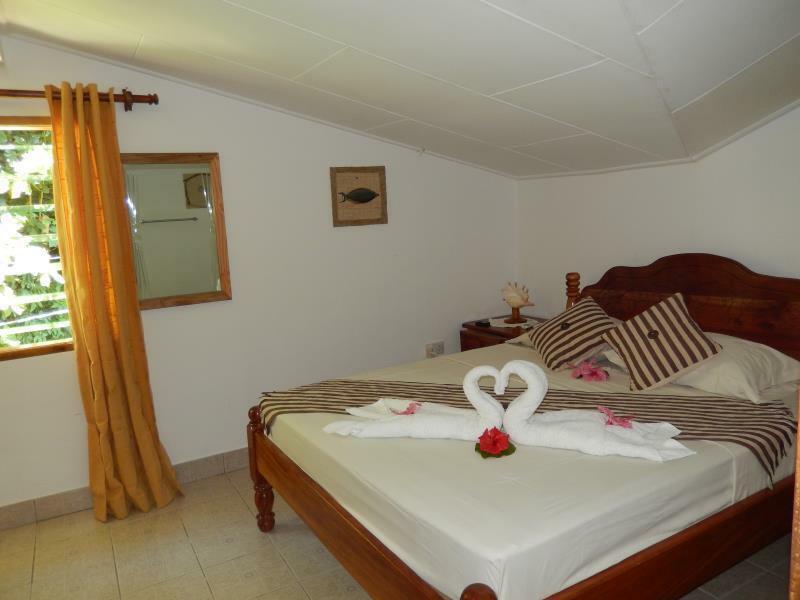 I would recommend staying here if you wanna spend quality time at La Digue. Just book more days, as you would regret not staying in this island longer! I really enjoyed my stay at Tannette's Villa. Close to everything but a tranquille place. Really nice and helpful staff, great breakfast, nice common areas. Very convinient: AC, wifi and own fridge just outside of the bedroom. Absolutely loved Tannette's. The room, while fairly small and basic, was nonetheless comfortable, clean and had everything I needed. Common areas were also very good - kitchen, living area, balcony and own fridge outside bedroom door. The staff were absolutely lovely and couldn't have been more helpful. Breakfast was above and beyond what I expected - starting with a platter of 5or pieces of fresh tropical fruit (mango, guava, passionfruit, coconut etc), then something cooked (e.g. Crepes, bacon and egg, omelette) and then toast with various jams made from local fruit, accompanied by fresh fruit juice and tea/coffee. Thoroughly enjoyed my stay and have no hesitation in recommending to others! Our stay here was idyllic – everything we needed was here for our self-catering stay. We were warmly welcomed by firstly Nerissa and then Tannette. The villa is situated up a mostly concrete lane off the main road next to the shore. You can walk there from the jetty (turn right and walk along main road for about 5-10 minutes (depending on your speed) till you see a sign for Tannette’s Villa or Fleur de Lys. They are both there but you may see Fleur de Lys first. Then follow the lane, for 4-8 minutes Breakfast was superb - fruit juice, fruit platter, porridge or yoghurt and finally a hot cooked dish accompanied by toast, butter and jam, with tea or coffee. You can also arrange a home-cooked creole dinner for which Tannette charges 300 SCR (prices in restaurants in La Digue are both above and below this, and bear in mind, the Seychelles ARE EXPENSIVE!) Tannette has bicycles on-site for hire, which saves time negotiating outside. Our room was in a villa, which had 2 rooms downstairs and 2 rooms upstairs – the shared lounge and kitchen were downstairs. The kitchen had all you could reasonably expect and in good condition – with 2 fridge-freezers. Our room was small but spacious enough with a thoughtful towel rail in the bedroom area as well as the normal one in the shower-room/toilet. The shower area was big and the shower delivered easily controlled hot and cold water. There was a washing line outside, carefully concealed from obvious view. We’d go back, without a doubt. i will definitely come back and stay here again. This guesthouse is very professionally driven. Tannette, who lives with her family in the neighboured building, really cares for her property. All is really clean and beatifully decorated. All the staff is very friendly and helpfull. You can let them wash your loundry, rent bikes (which are quite old but well maintained), cook a really good dinner for you etc. Of course you have to pay for those services but the prices are ok. The room we had was unbelievably tiny and hat no door to the evenly tiny bathroom. But okay, it is a very small island so I guess the room just fits its dimension haha. Aircon was good although a bit squieky from time to time. It was well cleaned every day. Breakfast was excellent and a little different each day. Wifi works good but not from within the room. The bed was very comfortable, the best hotel bed I ever slept in. Tannette & Julicette are very humble and helpful hosts. The best part about the stay here is "breakfast". It's a multi course breakfast and is very satisfying and will help you keep going for all your adventures and biking until late afternoon. Don't go looking for any other bikes shops, you'll get them here. I faced some problems with AC & Fan on the day 1 itself. But after requesting, Tannette didn't mind switching it the next day. You will definitely enjoy the company of other guests as well during your stay. The accommodation was fine, but was nothing special, although the breakfast on the terrace was good and the staff at breakfast helpful. The location is not so good though, down a lane which has almost no lighting at night, and it is also a short distance from the good beaches. No serious complaints or problems about the accommodation but looking around there seemed to be many other similar properties in much better locations. So overall it was ok but not outstanding. Nice cosy little place to stay. Very friendly and helpfull staff. Every morning different kind of breakfast. Breakfast was very filling and good.